Gotta love it when a Kickstarter ships its rewards at the perfect time - for instance, when you get a big box of zombies on October 2! Last year, Hong Kong's Locker Toys Group ran a Kickstarter for a new project, Zombie Lab. It's a very simple and straightforward concept: humans vs. the walking undead. Sold! Although the Kickstarter was initially just for 16 figures, the stretch goals and exclusives more than doubled that number. So basically, you can look forward to a lot of Zombie Lab reviews in the future. We'll start slow, with Banner. Even if all the figures weren't numbered, and he weren't figure #001, he'd still be a great starting point, because he's the man responsible for the zombie outbreak. Well, maybe: the story kind of starts in the middle of things, with zombies already a known factor and no word on where they came from; Doc Banner seems to be the head of Zombie Lab, the group responsible for trying to formulate a cure. Since the toyline's story has to continue through at least five more waves after this one, it's probably not much of a spoiler to say the scientists don't immediately succeed. The art of Banner included in the packaging makes him look like a fairly slender guy, kind of like Alex Moffat's SNL Anderson Cooper impression with the stubbly beginnings of a beard. The final sculpt is broader and thicker, and really feels like Donnelly Rhodes (aka Doc Roberts on Danger Bay and Doc Cottle on Battlestar Galactica). Frankly, the sculpt seems more like a guy who could survive a zombie apocalypse than the drawing does. Continuing the "I'm a worker, not an administrator" vibe, Banner is wearing his dress shirt without a tie, and his doctor's coat hangs open. The coat could perhaps stand to be a little longer - it's about the length of a standard sport coat, not a lab coat. Of course, that's probably because they want to reuse the mold going forward, and you're more likely to see civilians than scientists. 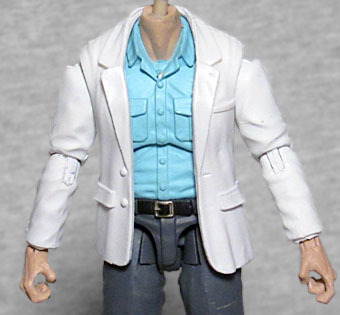 Still, look at a figure like GI Joe's Dr. Venom, who's wearing an actual lab coat, and the difference is apparent. Locker Toys partnered with Boss Fight Studio to handle the sculpting of the figures, so all the Zombie Lab figures are compatible with the Vitruvian HACKS. And to have compatible bodies means having compatible articulation, so Dr. Banner has a balljointed head and neck; swivel/hinge shoulders, elbows and wrists; a balljointed torso (limited hardly at all by the jacket); balljointed hips; double-hinge knees; and swivel/hinge ankles. Unlike the V-HACKS, the figure doesn't include an alternate set of hands with the hinge joint running the other direction; you'll have to be content with side-to-side movement, not up-and-down. 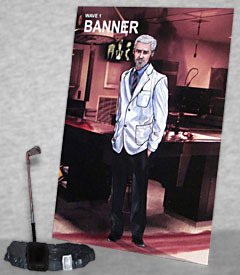 Since we're still early in the story at this point, Banner's accessories are fully mundane: a cellphone, a tablet, and a golf club. Really, if you didn't know this was for a zombie-themed toyline, those would seem like a perfectly normal, everyday selection of items. The sculpts are all good, with small details like the phone's camera or the tablet's kickstand not overlooked, so if you needed a 4" scale doctor for your collection, Banner would work fine by himself in that regard. Yes, the golf club is a little bloody, but it could also just be dirt, right? Maybe Banner's just bad at taking care of his clubs, or he found it rusting in the grass after his first hole in one, and keeps it as a souvenir. Make something up! 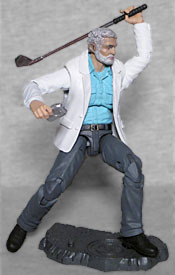 The figure also comes with an art card that has the first chapter of the Zombie Lab story on the back, and a display base to help keep him standing in more extreme poses. The original Kickstarter for Zombie Lab projected the figures would be released in April, with the only "risk" listed on the page that they might be delayed to May in a "worst scenario." The lesson here is to never underestimate how badly delays can hit toymakers (though being four months late is far from the longest backers have had to wait for their rewards to appear). 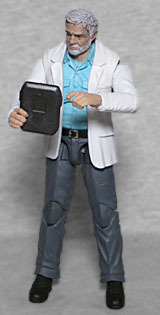 Doc Banner may not be a zombie, but he is a good figure and bodes well for the future of this line.